"Crazy, Stupid, Love" is a trans-generational look at the madness often inspired by affairs of the heart. It stars Steve Carell as Cal, a freshly cuckolded family man who is mentored by a relentless Lothario (Ryan Gosling) in the art of getting women in bed in an effort to help him reclaim his manhood. Though not without its problems, "Crazy, Stupid, Love" transcend its faults on the strength of its cast and injects a rare level of smarts and depth into the rom-com genre. Directors Glenn Ficarra and John Requa quickly establish the state of Cal's marriage to Emily (Julianne Moore) with a single shot of their feet—he's sporting a pair of white New Balance 407s, she's' rocking 4-inch heels. Suffice to say, these two have arrived at different places inexplicably together. Cal is well-trod territory for Carell, a mix of his clueless "40-Year-Old Virgin" and his too-settled character from "Date Night," but here Carell plays the part with sincere moments of drama. The situations are easily played for jokes, but there's real pain behind the laughter. The casting of Gosling is absolutely inspired. News that he was taking this role was met with incredulity, but watching him play Jacob with self-aware glee is a treat. The professional ladykiller is a role that begs to be played broadly, tempting less disciplined actors to go over the top. But Gosling resists, playing it straight, letting the inherent ridiculousness of skirt-chasing supply the humor, occasionally letting a little twinkle in his eye let you know he knows how stupid he is. 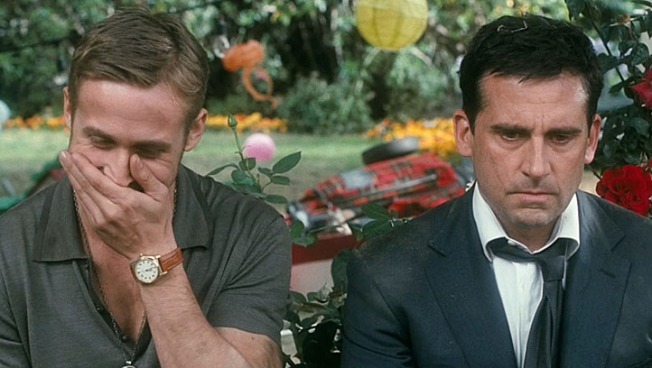 Gosling and Carell develop a great rhythm, one that shifts to track the progress of the dynamic between the two. Gosling is equally great opposite Emma Stone who plays the woman with whom he unexpectedly falls in love. His first attempt to bed her is a master class is modern day thrust-and-parry, and the night she goes home with him hums with chemistry--if only there were more of it. Unfortunately, screenwriter Dan Fogelman spreads the love around too thinly--Cal's 13-year-old son, Robbie (Jonah Bobo) is in love with his 17-year-old babysitter, Jessica (Analeigh Tipton) who's in love with Cal… And Ficarra and Requa lose the reigns on the tone of the film as it devolves into French farce territory. Fogelman has made a career of penning animated films for kids, while Ficarra and Requa are the guys whose explorations of humanity's darker side includes "Bad Santa" - "Crazy Stupid Love" at times feels like those two sensibilities are fighting for primacy.